The San Juan Islands are a unique archipelago located between the state of Washington and Canada’s Vancouver Island. More than 400 islands and rocks are considered part of this natural wonder. Of those, 128 are named, and many are uninhabited and undeveloped. This untouched nature is what draws tourists, scientists, photographers and adventurers from around the globe to the San Juans year after year. The islands host a diverse set of habitats among their wetlands, grasslands and woodlands. This variety, and a low carnivore population, contributes to the presence of a vast array of wildlife. Shore birds, geese, swans, owls, beaver, rabbits, mink, black tail deer, butterflies and more thrive on the San Juans. The most famous residents of the archipelago are three pods of Orca whales, which draw thousands of tourists each season who view them by boat, plane, and even by kayak. 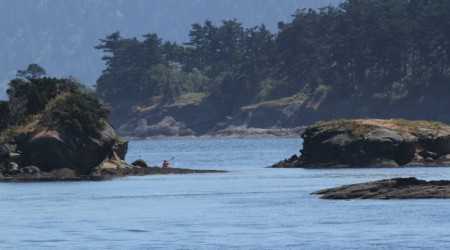 The islands are also home to the largest concentration of bald eagles in the continental U.S.
Our students spend time in the San Juans kayaking and cycling, and camping on some of the lush, uninhabited islands, which are only accessible by private boat or kayak.